Most shore anglers probably began their sport as youngsters fishing from harbour walls or "crabbing" in rock pools with hand line and limpet. As the angler grows older and more experienced, the tackle might change but the thrill and excitement of shore fishing remains the same. The British Isles has many venues for the shore angler. There are piers and jetties and estuaries and harbours. There are rocky headlands and breakwaters and countless beaches. Most places will hold a mixed selection of fish but there are places that almost guarantee certain species. Harbours and jetties attract large shoals of mackerel and mullet that swim close to the surface. Close to the sandy bottom is the habitat of dab, flounder and plaice. Rocky coastlines stretch for miles and are ideal places to catch bass, pollack, wrasse, bream and conger eel. Codling, ray, sole and whiting are among numerous species that can be taken from beaches. Mackerel are the usual summer target from piers. At night time more species such as pouting and pollack tend to move closer inshore giving pier anglers an extra bonus. A rod between three or four metres long would be a sensible choice. A rod this size could be used from pier, beach, estuary and rocky headland. For purely beach fishing there are specialised beach casting rods available. These are long rods and used by an expert, can cast bait far beyond the breakers. Light rods, which sometimes double up as coarse fishing rods, are suitable when float fishing for mullet in harbours. Conger eel can grow to be enormous creatures so fishing for them from rocks will require a strong, heavy rod. For casting long distances with a weight the multiplier reel is the best choice. However, for the novice, the multiplier can cause frustrating problems. It has the tendency to overrun and this can develop into a tangled mess of knots and loops. A fixed-spool reel is easier to use than the multiplier and is the standard choice for basic shore fishing. Put a line of about 15lbs breaking strain on the reel. Natural bait for shore fishing can be bought in tackle shops but why not collect your own and save money? 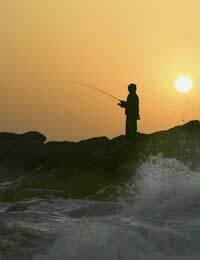 The coast line is rich with bait that forms the natural diet of fish. Use a garden fork and a bucket to collect lugworm and ragworm from the wet sand at low tide. Worm casts and blowholes will indicate where to dig. With a sharp knife, prise off shellfish from rocks. Cockles are good bait for dab and whiting. Bass will take limpet and mussel is good bait for codling. Peeler crab, which is found at low tide in estuaries, is considered the top bait by many shore anglers. Spinners are bright and when reeled in they rotate and vibrate. This movement, imitating an injured or vulnerable fish, will tempt bass to attack. Made up sets of feathers are available at tackle shops. When the feathers are jerked through the water they resemble a shoal of fry which often proves irresistible to mackerel and pollack. The weather can change dramatically while shore fishing so warm clothes and waterproofs are a good idea. Rocks might be slippery with water or seaweed therefore wearing rubber soled shoes will make the situation safer. Scissors are useful for cutting line. Tidal swells and waves can be unpredictable and that's why sensible shore anglers respect the sea.